StrandVision Digital Signage has announced an innovative digital signage utility that enables electronic sign administrators to monitor the status of their StrandVision Digital Signage networks via a desktop PC or a smart phone from anywhere and at any time. 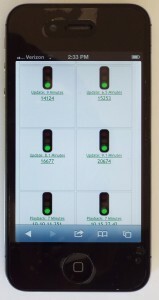 The new notification utility employs familiar and easily understood stoplight icons to indicate overall and individual digital media player status. Green obviously signals normal operations; Yellow indicates a potential problem that usually has not yet affected signage operation; Red indicates a communication or player issue that has put the digital media player in automatic recovery mode while it waits for updates. To hear more about digital signage for your organization, please give us a call at 715-235-7446 (SIGN) or visit www.strandvision.com. When Redbox began renting video games in 2011, it’s unlikely the company was prepared for the onslaught of scam artists bent on duping the kiosks out of a game disc. Now, two years in to the game rental service, Redbox is still struggling to prevent the thefts. This entry was posted in Uncategorized and tagged digital signage, digital signage solutions, free digital signage. Bookmark the permalink.